Garlic grows in a bulb containing many separate cloves. The cloves are covered in a paper thin skin that is removed and discarded before use. 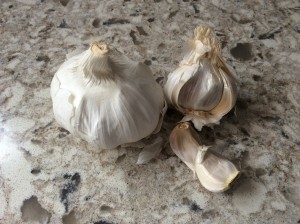 Garlic can be used both cooked and raw. It can be roasted or sauteed. 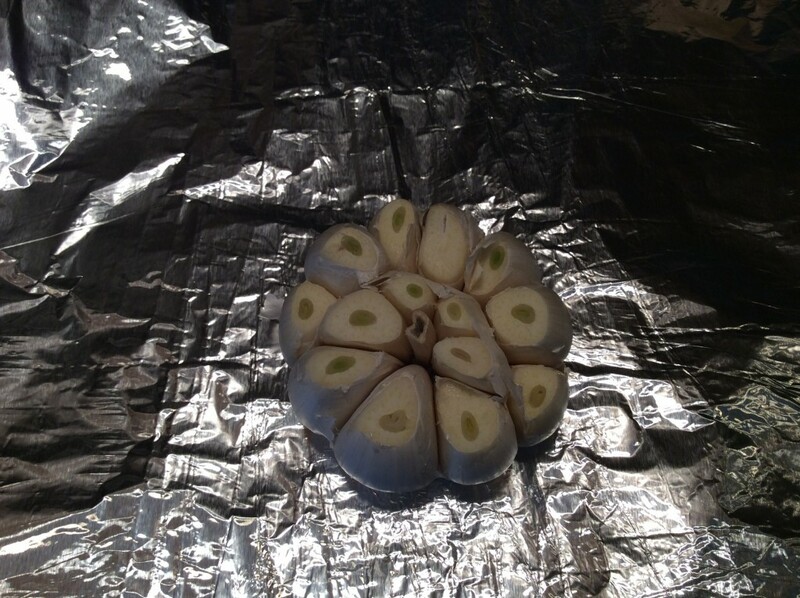 If there is a green sprout in the center of your garlic clove, simply remove it and continue. Garlic has a very strong odor due to sulfur compounds, but that is what makes it so good for us. Eating garlic with fresh parsley may reduce any mouth odor, or better yet, share garlic with the people around you and it won’t matter! A tip for removing the garlic smell from hands or cutting boards is a fresh lemon. Simply cut a lemon in half and rub it all over the area, then wash with soap and water as usual. A fun and helpful tool to use in the kitchen is a garlic press, worth the investment, in our opinion. There are many varieties of garlic, the most popular are white garlic, pink garlic, and giant or elephant garlic. Garlic has been valued as a health protector for thousands of years, and for good reason! Modern medicine has shown that garlic has a powerful effect at boosting the immune system, aids in cardiovascular health, and fighting cancer. Cook it slowly til it’s brown and sweet…..
That’s right my Springdell friends, today we caramelize. 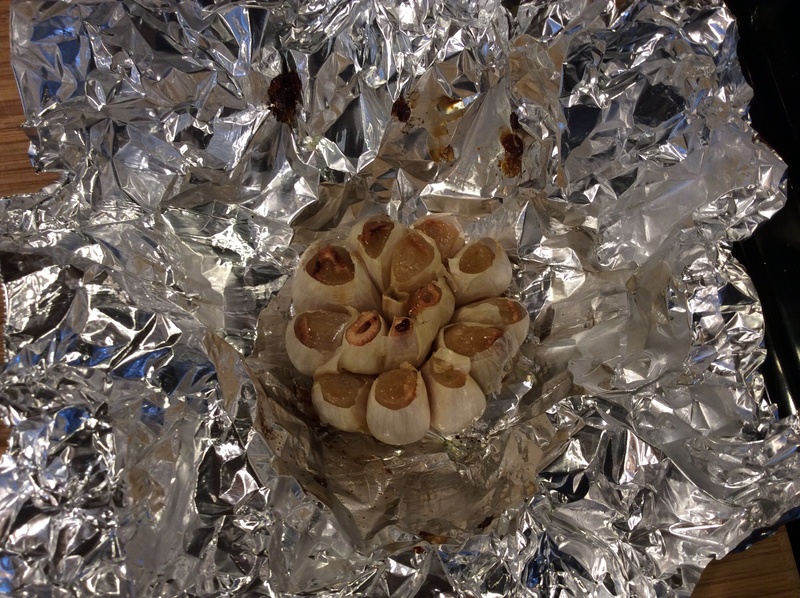 Cut the whole head of garlic and make sure each clove is exposed, take off most of the papery outside at this time. Drizzle led the garlic with olive oil and wrap that sucker up. 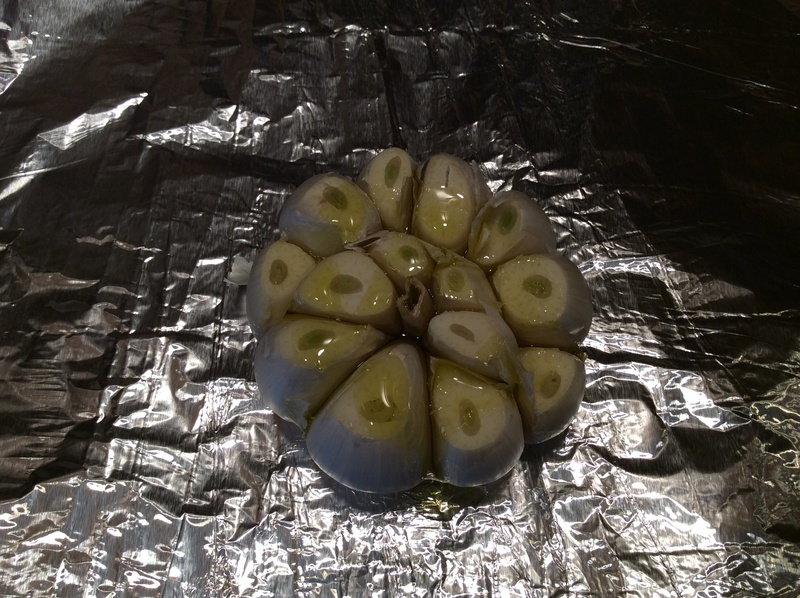 Put the wrapped garlic into a preheated 400 degree oven for about 40 minutes. This is a little piece of heaven. You literally squeeze the garlic out and put it in just about anything. I have made roasted garlic dips,in even added it into the chili I made Sunday night. Baingan Bharta is a dish that involves grilled and mashed eggplant with yummy spices. You can choose the spice level that works for you by varying the amount of hot peppers used, and whether or not you choose to include the seeds. If you’re short on time, grill the eggplant ahead of time and store it in the fridge until you’re ready to cook up the rest of the dish. If you’re lucky enough to have leftovers, I found this dish is even more delicious the next day. Thanks to NYT Cooking for this adaptation, who adapted it from chef Julie Sahni! Nan’s famous cabbage roll recipe with a few tweaks for modern day convenience. Adapted from the “Taste of Home” magazine, this one fuses lasagna with galumpkis in a satisfying way! The non-cabbage lovers in my household can’t resist it… A can of Campbells tomato soup is one of Nan’s secret ingredients, and doesn’t live on the “Staples” list in Veggiescope so you’ll have to make a trip to the grocery store, but I’m willing to bet it’s good without it, too. Got tomatoes? This one is great for that influx of ripe heirlooms! A homemade or store bought pie crust will be needed, but the rest is simply simple. You’ll need some time (a few hours) to allow the tomato slices to lose their liquid, so plan for some prep in the morning and things should be ready for baking by dinner time. This one was shared by fellow Springdellian Dawn DeMeo a great one to use up the last of the seasonal corn, peppers, jalapeños and onion. The source is Cooks Illustrated, a fabulous local test kitchen. It’s a wonderful recipe as it’s very flexible in its ingredients, and easy to make your own. Check them out and try this one today! Fire up the grill! Here’s a quick and tasty marinade, and a fabulous use for those jalapeños! If Tequila isn’t in your pantry, you’ll need just a nip’s worth to make this one. If working with frozen jalapeños, remember that they’ll be twice as hot as the fresh ones! Don’t fear the turnip! This is a great side for all kinds of savory dishes. If making this during the fall season, toss a crisp diced apple into turnips during the last 5 minutes of cooking for a welcome sweet crunch. If it’s the summer season, forego the apple and use the thyme.